L-R: General Manager, Human Resources, representing the Managing Director of Nigerian Ports Authority (NPA), Mallam Yahaya Bukar; CEO, Ships & Ports, Bolaji Akinola; President General, Maritime Workers Union of Nigeria, Comrade Adewale Adeyanju; Executive Director Operations, Nigerian Maritime Administration and Safety Agency (NIMASA), Engr. Rotimi Fasakin and Captain of Team NPA lifting the Maritime Cup in Lagos on Tuesday. 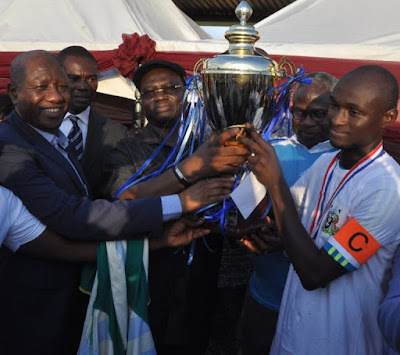 The Nigerian Port Authority (NPA) on Tuesday defeated the Nigerian Maritime Administration and Safety Agency (NIMASA) to emerge winner of the 2018 edition of the Annual Ships & Ports Maritime Cup Competition. The NPA team, fondly called ‘Hadiza Warriors’, defeated NIMASA 4-1 after a tension soaked match to lift the coveted trophy for the first time since the competition started in 2009. Also, 2017 champions, the Nigeria Customs Service defeated the Nigerian Navy 4-0 to win the third place match. The matches played at the NPA Sports Ground Bode Thomas, Surulere, Lagos witnessed a large crowd and supporters of both teams. NIMASA scored the opening goal in the 4th minute through Anderson Onye but the NPA team equalized in the 9th minute through Bashiru Yusuf, who also gave NPA the lead in the 20th minute. Kabiru Zakari netted the third goal for NPA in three minutes into the second half while Henry Nwosu sealed NIMASA’s fate with a 4th goal in the 36th minute of the second half. At the end of 90 minutes, NPA prevailed 4-1 in the action packed game. The final match was kicked off by the President General, Maritime Workers Union of Nigeria (MWUN), Comrade Adewale Adeyanju, who lauded the Ships & Ports for conceiving and sustaining the competition over the years. He promised that the union would support and also be part of the 2019 edition. A total of 62 goals were scored in this year’s edition of the competition out of which Abubakar Mikaili of Customs scored seven to become the highest goal scorer. Highly elated coach of NPA, Okafor Emmanuel, expressed appreciation to the Managing Director of NPA, Hadiza Bala Usman, for given the team the opportunity to participate in the competition. He said, “I just want to thank the Authority led by our amiable Managing Director, Hajia Hadiza Bala-Usman, who has given so much to sports. She has helped brought back sports to NPA. We are proud to say that to whom much is given, much is expected because we have delivered. Other dignitaries that graced the occasion were the Executive Director Operations of NIMASA, Engr. Rotimi Fasakin; General Manager, Human Resources, representing the Managing Director of Nigerian Ports Authority (NPA), Mallam Yahaya Bukar; General Manager, Land & Asset of NPA, Engr. Jatto Adams; Chairman, Shipowners Forum, Mrs. Margret Onyema-Orakwusi; and President, Dockworkers Branch of MWUN, Comrade Ibrahim Ohize, among several others. The competition this year was supported by Dangote Ports Operation and Morbod Group. Past winners of the Maritime Cup are Nigerian Navy (2009), Micura Services (2010), Customs (2011, 2012, 2013, 2016 and 2017), NAGAFF (2014) and ANLCA (2015).